Unexploded military ordnance and toxic chemicals, some dating back to World War I, are a worldwide concern, especially at closed military bases that will be redeveloped for housing or civilian use. In Europe and Asia, many munitions sites are former battlegrounds; in Russia and its former territories, sites are used for storage and waste disposal. Experts estimate that the United States alone could spend between $50 and 250 billion dollars to cleanup these sites, many of which are in high-population density, residential areas. 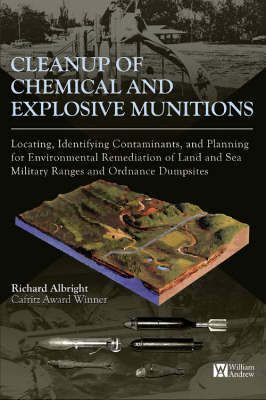 You might live near one such site right now.This book gives detailed instructions for cleaning up military ordnance sites, and lists of explosives, chemical warfare materials and breakdown products that the soil and groundwater must be tested for. Also included are archival studies; remote sensing techniques; geophysical techniques; safety issues; a chemical weapons, explosives and ordnance primer; known and unknown range lists; and a case study of documents written for cleaning up one of the worst examples yet: Spring Valley in the District of Columbia.It disproves myths, common misconceptions and lies, and explains what, how, and where to look for munitions and their residual contamination. The author is an award winning and world-renowned expert in weapons of mass destruction. It meets the needs of explosive and ordnance demolition personnel, as well as environmental scientists, insurance agents, and building contractors. It includes the primary documents written (by the author) for the cleanup of one of the worst sites in the United States (Spring Valley, District of Columbia). The subject of the book is of worldwide concern with former battlegrounds in Europe and Asia, as well as storage and waste disposal sites in Russia and former Soviet territories. It is the only text available with clear and complete instructions on proper cleanup of military ordnance sites including a detailed list of explosives, chemical warfare material and breakdown products.